Hi there blog friends! Yep, box mode again! I can’t explain why but I’m rolling with it and it’s a good change of pace for me. 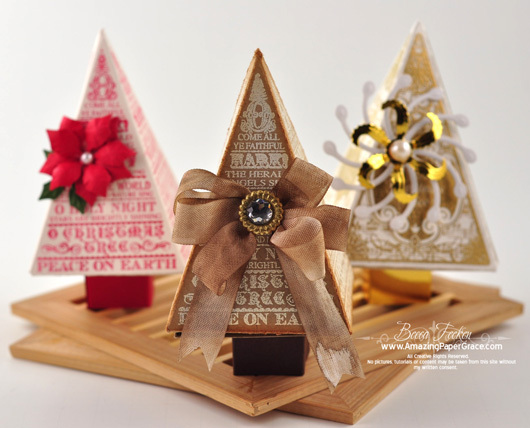 This is another of the October JustRite Stampers releases and this one is called O Christmas Tree. I love the font and love the shape!! I stamped the shape multiple times, scored and came up with a simple box that will work for place settings and favors and can be opened by a flap on the bottom. I stamped the three stamp four times in a fan arrangement and scored between each stamping. Before cutting I allowed for a 3/8″ flap on one side and 1″ on all the bottoms. I then matched the right sized Spellbinders™ Classic Squares LG and cut it on a fold to fashion a flap that I adhered to one of the 1″ flaps. That let my box close on the bottom. Then I cut a strip of paper 4 1/2″ long and scored it at 1″ intervals, turned and scored 1/2″ in. This made the trunk of the tree – once assembled, I attached it to the bottom lid with glue dots. Happy Monday friends! I hope you are waking up to a beautiful new week. Your little tree boxes are so adorable! Love the different colours you have created them in. So festive! Oh these are gorgeous Becca!!! Wonderful ornament to hang on your tree!!! I love the colors also but can see that it would look good in many colors. I always make the younger kids a ornament for when the get old enough to have a tree of their own. Or some already do!! This just may be the one I do. These boxes are gorgeous as is all your work, Becca. You truly are an artistic genious. I would love to make these, but like Dianne would need a video tutorial. Thanks for everything you so lovingly share with us. Oh, I bow down to you!!!!!!!! LOL!! I have been following your blog for a very short time,but WOW.I have a sight problem,so I print your beautiful works of art out,not to copy,but to give me inspiration. These boxes are “Amazing” I am off to try it out. I am a very “Visual” crafter so maybe a “Tutorial” would be good. This is a breathtaking design. Thanks for sharing it. Love the boxes, your work is so inspiring. You stay on the box kick. I love the Christmas tree boxes. You are and always will be AMAZING. Becca, Becca – you’ve done it again….. 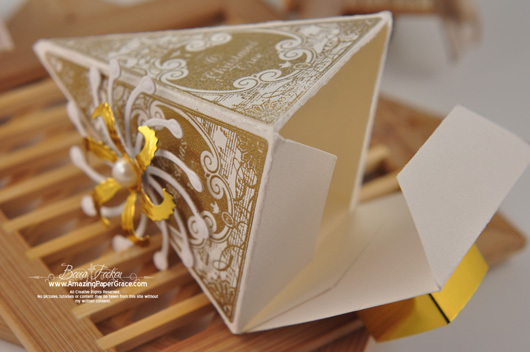 These little boxes are gorgeous and will be so useful for lots of occasions… my head is buzzing …. like all your followers it seems … I do hope you do a tutorial (no pressure!!!). idea and can be used for so many different ideas. You sure are coming up with some good ideas. Becca, just keep it up. What fabulous tree boxes! Just love them! What a wonderful box! Will we have the pleasure of viewing a tutorial! I just love those decoations. Not like you to be away from us for so long. Maybe I have missed something and you are off on holiday. Wow, Becca! What a gorgeous project! So unique, fresh and lovely! Beautiful workmanship too! Becca – What a beautiful box…I would love to make these for co-workers. Do you have a tutorial for this?